Try Our Holiday Special Recipes! Enjoy all your favorites this Thanksgiving by making healthier options! 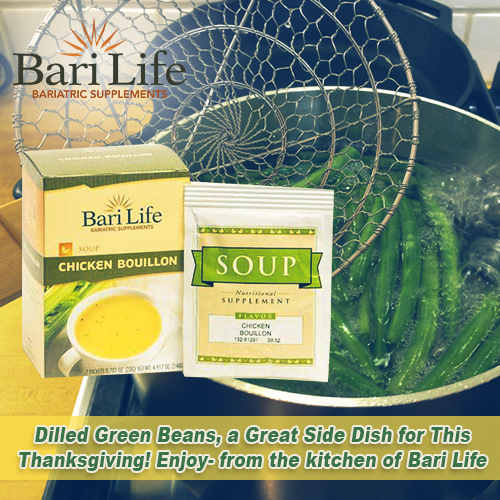 Check out the special holiday recipes we’ve made especially for you using Bari Life protein supplements! 1. Toast bread, then crumble. 2. Dilute 1 package of soup with ¼ cup water. Season with sage, and stir in onions. 3. Combine bread crumbs with soup mixture and place in bottom of oven-safe dish. 4. Layer turkey on top. 5. In a small bowl mix remaining soup packet with remaining water, adding more water if necessary. 7. Heat in microwave oven until warm. 1. In a small saucepan cook cauliflower according to package directions until very soft; drain. 2. Mash with fork and add ½ package of chicken soup. Mix well. 1. Cook green beans over medium heat for approximately 10-15 minutes. Drain. 2. Combine salad dressing, chicken soup, vinegar and dill. Pour over green beans.